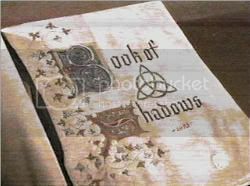 Book of Shadows in Your Wiccan Supplies Part 1- As with all spiritual texts, there is large debate about where and how a book of shadows came into use. Some say they were prevalent during the middle ages, written only in Runic alphabets to hide their magikal meanings. Some say the witches during the middle ages were illiterate and the books of shadow did not come into practice until the 14th or 15th centuries. Even then, Runic alphabets were used to protect the owner from persecution and death if it were found by a witch hunter. Regardless of where they started, they’ve had just as many varying names. The Golden Grimoire is one of the more famous mythological versions of a book of shadows. It’s said to be the Book Of Shadows of Merlin the Magician himself. The Great Grimoire is another legendary book of shadow, reportedly it contains the spells and incantations of the world’s first witch, who received this magikal information from Lucifer (the Angel, not the devil). The Great Grimoire supposedly contained all the secret information about God, including his name of creation. When this name is said backwards, the world becomes undone. Riding the universe of the creature called man and returning the heavens to the Archangels. Unfortunately, many educated scholars believe this legend to be a creation of the Catholic Church during the early 12th century. A mythological tale designed to cast doom and gloom upon those who practiced paganism during that time in history. The “Book of Light and Shadows” is a term that found popular use during the mid-to-late 1800s in Europe. Just about the same time Alester Crowley began to publicize his many works on the Craft. This title is meant to reflect the spiritual information contained within, as well as, the spells and rituals that are performed at night beneath the moon. “Grimoire” became a popular label for these personal books of shadow during the Victorian era. Many a young woman could be found resting in a park, or flower garden writing thoughts, poems and wishes inside a diary. Upon closer review, you might also find remedies passed down from grand mother to child for various ailments. Elixirs and salves for poison ivy, fevers and more serious ailments such as heart problems or arthritis were often shared amongst family members as well as within tight knit communities. It is from these family recipes and remedies that the term “Kitchen Witch” sprang. Today the most common label for these personal diaries is a “Book Of Shadows”, presumably containing spiritual information and energy that is kept hidden until a witch opens the book and springs forth the words into the light. It doesn’t matter what you chose to call your personal magikal diary. It’s just important that you start keeping a record of your research, experiences and magikal information. Please visit part 2 for more.